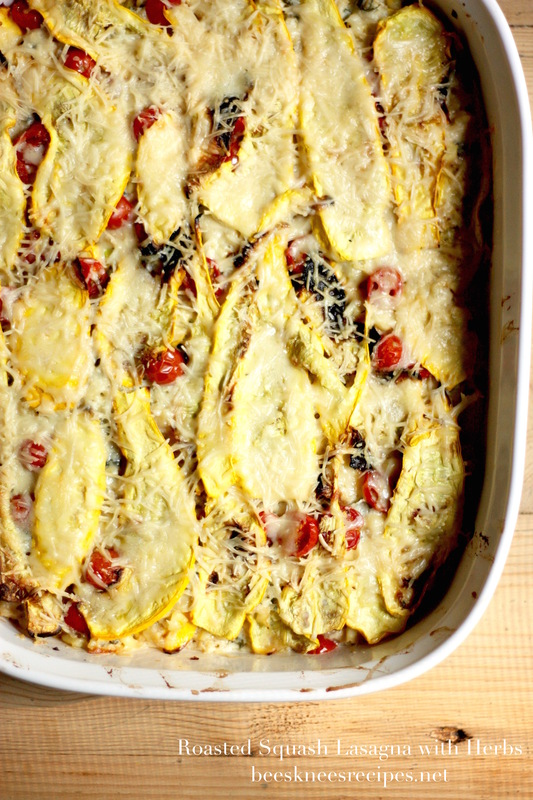 I found this recipe in my Sunset magazine last month (or so), and since my yellow squash plant is by far the most happy one in my garden this year, this recipe got used immediately. I then took thislasagna with me to a potluck gathering (it was a little on the fly–I had to use what I had in the house–another point for this recipe), and it turned out to be quite a crowd pleaser, so I’m happy to share it. I wish I could claim more responsibility for its invention, but my only contribution was throwing in cherry tomatoes (which are not in the original recipe), since I have a small tree of a tomato plant growing out of my southern window. This recipe is a delight. Perfect for this time of year. 2. Meanwhile, heat a grill to medium (350° to 450°). Heat 1 T. oil in a medium frying pan over medium heat. Add shallot and garlic and cook, stirring constantly, until beginning to brown, about 2 minutes. Add corn and thyme and cook until corn is just hot, 2 to 3 minutes. Transfer to a medium bowl. Stir in ricotta, half of parmesan, the egg, basil, chives, pepper, and remaining 1/4 t. salt. 3. Preheat oven to 375°. Press water out of zucchini with more paper towels and remove all paper towels from baking sheets. Brush zucchini all over with remaining 2 T. oil. Grill half of zucchini, turning once, until grill marks appear, 2 to 4 minutes; transfer to rimmed baking sheets as cooked. Repeat with remaining zucchini. 4. Butter bottom of a 9- by 13-in. baking dish with 1/2 T. butter. Arrange a quarter of zucchini ribbons crosswise in ­bottom of dish, overlapping slightly. Evenly spread a third of corn-ricotta mixture over zucchini. Sprinkle with a handful of tomatoes. Repeat process 2 more times, ending with zucchini. Sprinkle remaining parmesan on top and dot with remaining 1 T. butter. 5. Bake until lasagna turns golden brown, about 45 minutes, rotating dish halfway through for even browning. Let rest 20 minutes before serving.